On medium heat, grill burger (with chopped onion mixed in…and jalapeños of desired) on one side for three minutes. Pour New Plant Pale Ale over burger…wait thirty seconds and flip. Pour a little more beer on the burger. Add salt and pepper…wait two minutes. Add blue cheese and bacon (previously cooked)… Wait two minutes and you are done. The perfect burger. 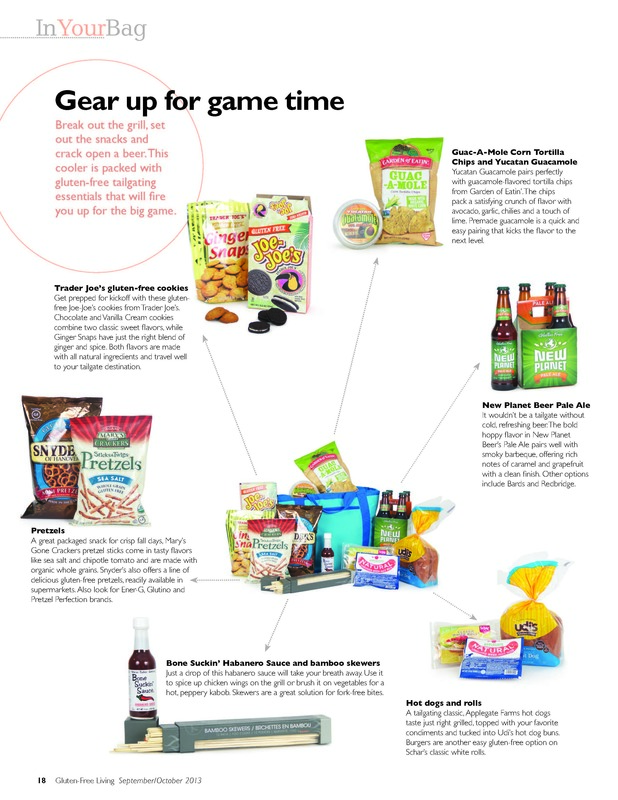 Gluten-Free BBQ recipe with the Nation! Plan: We are asking our fans – YOU – to submit their favorite gluten-free BBQ recipes & beer pairings featuring New Planet Beer. Submissions will need to be received via email by June 27th, and will be posted on Facebook and our website as the featured recipes for July. 3 winners will be chosen. Winning entries will need to feature a New Planet Beer either in the actual recipe, or as a “perfect pairing.” Pictures to accompany the recipes will be welcomed. Winning recipes will be posted to the New Planet Beer website the week of JULY 4th – for all to see – with a quick Bio on the Recipe Author, and then shared on our Facebook and Twitter network. 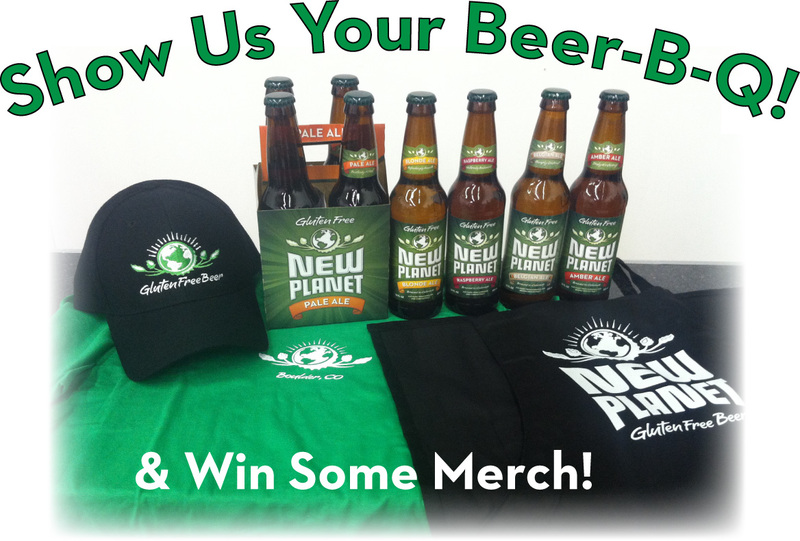 Winners will also receive a custom prize pack featuring a New Planet Beer Apron, T-shirt, Bottle Opener and Baseball Cap as well as a Four-Pack of the Beer of their choice! Lastly, winners will also receive a personally signed copy of the best selling book, Defeat Wheat, by Brian Gansman. Gluten-Free Raspberry Beer Chicken – Perfect Summer Dish, with a great Summer Beer! Place the Ziplock bag in a Baking Pan and Marinate minimum 4 hours in the Refrigerator. Make sure that each piece of Chicken is in the Marinate. Turn the Bag a few times while it is marinating. Remove the Bacon after it is crispy from the Fat and drain on a Paper Towel. Using the same pan that you fried the Bacon in. Place 2-3 Tbl. Bacon fat in a Skillet heat to Medium High (You can substitute Extra Virgin Olive Oil if you don’t want to use the Bacon Fat) Remove the Chicken from the Marinate,, Discard the Marinate. Brown the Chicken on one side for about 3 Minutes, turn the Chicken add Fresh Garlic to the Pan, Sprinkle the Chicken to taste with Rosemary and Parsley. Brown the second Side Approximately 3 minutes. Then add the Remaining 4 oz Ale. Turn the heat down to Medium. Sprinkle on the Chopped Bacon. Pour some of the Raspberry Sauce over the Chicken and Rice. Bake in a 400* Oven for Approximately 25-30 or until done. Tossing them a few times while roasting. You can watch the VIDEO as well. 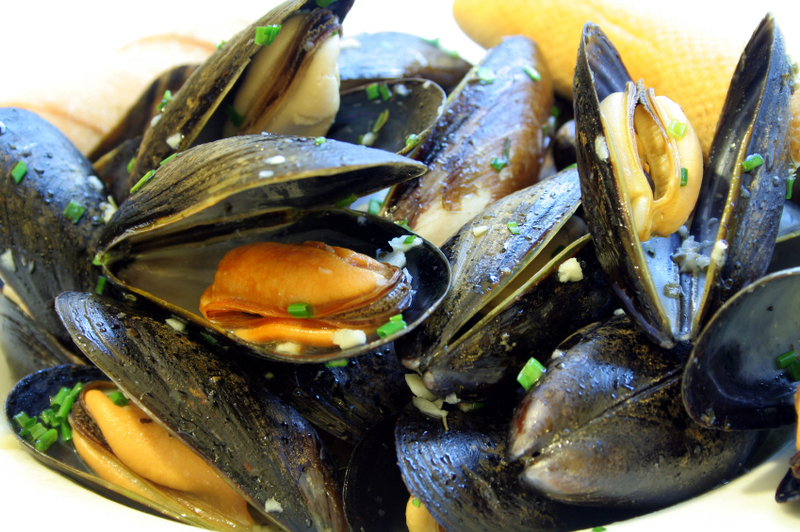 Visit Brenda’s Blog to find more recipes. https://www.newplanetbeer.com/wp-content/uploads/2013/05/raspberry-chicken.jpg 462 616 GFBeer https://www.newplanetbeer.com/wp-content/uploads/2016/01/mobile-logo.png GFBeer2013-06-01 08:00:522013-06-18 10:28:51Gluten-Free Raspberry Beer Chicken - Perfect Summer Dish, with a great Summer Beer! Take one bottle of nicely chilled New Planet Raspberry Ale and pour into wine glass, then add 1oz of freshly squeezed orange juice. Sip & Enjoy! Find our Raspberry Ale near you by clicking HERE. Cinco de Mayo meets Celiac Awareness Month! With the start of National Celiac Awareness Month coinciding the Cinco de Mayo celebration we thought we would share a wonderful recipe that pairs beautifully with our Blonde Ale. Place pulled chicken meat into a sauce pot and pour salsa over it. Simmer chicken in salsa for 15-20 minutes and season with salt.Toss shredded cabbage, cilantro and radishes in a bowl with lime juice and olive oil, season with salt and pepper. https://www.newplanetbeer.com/wp-content/uploads/2016/01/mobile-logo.png 0 0 GFBeer https://www.newplanetbeer.com/wp-content/uploads/2016/01/mobile-logo.png GFBeer2013-05-01 10:00:432013-05-01 14:48:14Cinco de Mayo meets Celiac Awareness Month! Fun Review from Iowa Gluten & Allergen Free Expo, Thanks Lilly! Thanks for enjoying New Planet Beer! 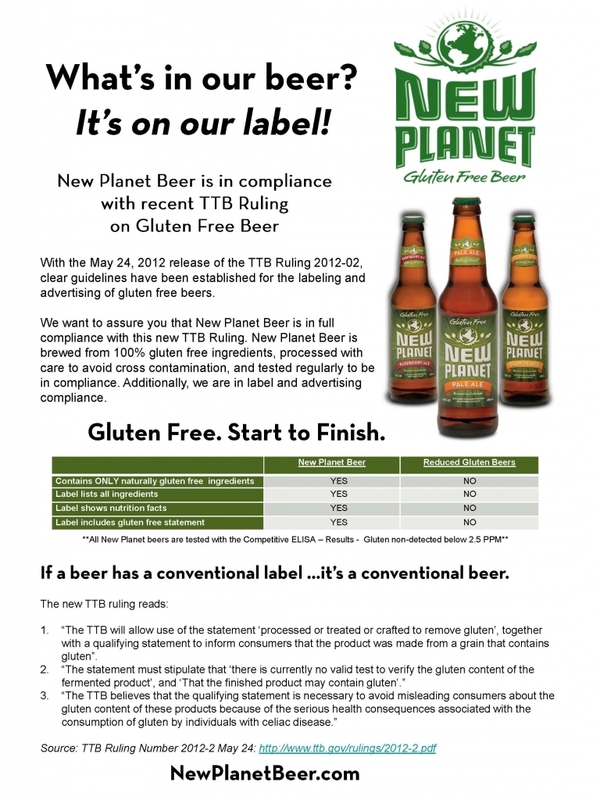 https://www.newplanetbeer.com/wp-content/uploads/2016/01/mobile-logo.png 0 0 GFBeer https://www.newplanetbeer.com/wp-content/uploads/2016/01/mobile-logo.png GFBeer2013-04-18 11:14:442013-04-18 11:14:44Fun Review from Iowa Gluten & Allergen Free Expo, Thanks Lilly! GLUTEN FREE. START TO FINISH! https://www.newplanetbeer.com/wp-content/uploads/2016/01/mobile-logo.png 0 0 GFBeer https://www.newplanetbeer.com/wp-content/uploads/2016/01/mobile-logo.png GFBeer2013-04-11 10:08:502013-04-11 10:08:50GLUTEN FREE. START TO FINISH!